Not everyone starts as an expert in the area of online trading or can manage every single necessary step by themselves. However this is not necessary at all. Depending on the license model shopware offers you different possibilities to get yourself some support. This article is supposed to show you who you can contact and where the differences between the separate contact points are. Basically we differ between two license models. If you want to start setting up a shop and want to look how your business model is evolving without investing money our Community Edition is surely the right package for you. The Community Edition (CE) is completely free of costs and offers you all basic shopware functions. For established online shops or startups which want to invest into their online shop from the start we offer a Professional Edition (PE). Besides the advanced features (features of shopware that are only available in a Professional Edition), you can also only get official support from shopware with this version. The price of the Professional Edition is always based on the size of your shop. You can inform yourself about this here. The shopware support is the first contact point for all those who have bought a Professional Edition (PE). The technical support of shopware aids you with setting up your shop and with all questions regarding the configuration and handling of the shopware frontend and backend. Based on the subscription you booked Shopware guarantees you a reaction within defined reaction times. Also some subscriptions offer you the possibility of a callback. Bigger subscriptions also allow you to use the developer-support. While the developer-support does not provide you complete individual solutions they will answer you any specific questions regarding the implementation of your individual requirements. Of course you can also ask specific questions about your implemented plugins. 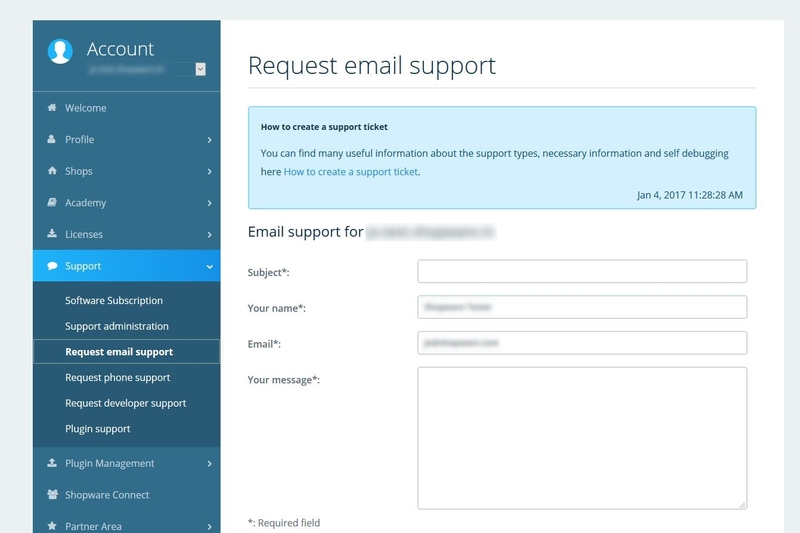 Last but not least some subscriptions offer you an "emergency-support" which allows you to contact us outside of the normal support working-times because of serious issues in your shop. You can find further information about the shopware-support on our homepage. The community forum is meant for all different user types from the shopware universe and also is the contact point for all shop owners with a Community Edition. Based on the slogan "shop owners help shop owners" the forum lives from mutual help between the users. 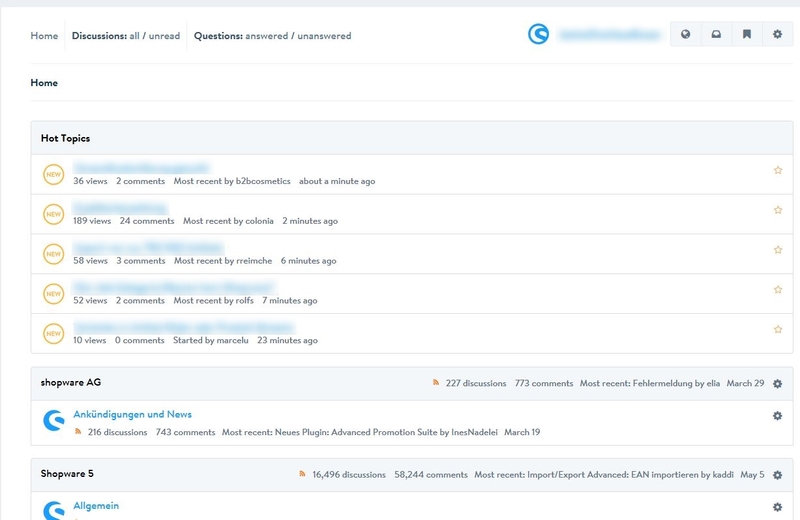 Of course it might happen that nobody there knowns the answer to your question so we would ask you to share it with the community if you find it yourself, because the forum need the users to share their own experiences and solutions. The forum is unrelated to your shopware-account so you can register completely anonymously and and without any relation to your shop to participate on the discussions of the community. When creating a post it is important to describe your problem as detailed as possible so the community can understand your issue and support you as best as they can. We have a wide ranged net of shopware-partners, meaning agencies that have been checked by us on their quality and service and gotten a certificate for that. The shopware-partner is a solution for everything - he can implement you individual functions, take over setting up your online-shop completely or answer you those questions that have not been answered by the community. Of course the services of our partners have to be paid. If you search for someone who can support you perfectly with setting up your online-shop you can look for a partner at our partner overview.